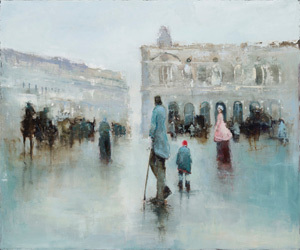 France Jodoin‘s art is themed around the passage of time and the very brevity of life itself. Oil is her principal medium but her work also embraces sketches, watercolours, sugar lift etchings and aquatints with which she creates a unique universe, imbued with nostalgia and timeless beauty. Layered marks, washes and blurred lines bring to life the characters and landscapes from another era. Far from being historical representations, they nonetheless use the past as inspiration for creating specific details. The end results are atmospheric images that invite the viewer to look deeply within themselves. The artist, who lives and works in Cowansville, has been showing her work in museums and galleries throughout Canada, the United States and in Europe for 15 years. Most of the artwork in the exhibition The Other Landscape has never been shown before. 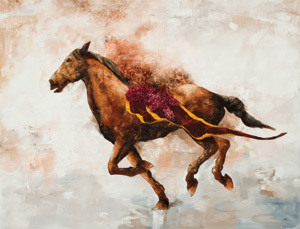 A painter with 25 years of experience who has exhibited his work around Canada and overseas, Kevin Sonmor, in the exhibition Nomads, Players and Saints, depicts the conflict between the elusive and the rational. His approach is a blend of the baroque, classical and modern and he aims to create a balance between the figurative and the abstract – ways of portraying a subject that are often considered to be contradictory. Indeed, Sonmor’s work challenges us not to be distracted by representations of caves, imaginary waterfalls, boats, grapes, horses and so on. It rather invites us to focus on the fundamental complexity of the images, which, through unlikely combinations and unusual elements test the viewer’s ability to interpret a picture in the normal way. When creating, Sonmor employs a wide range of techniques.